Snapchat and Jeff Koons partnered for virtual art installations worldwide in 2017. 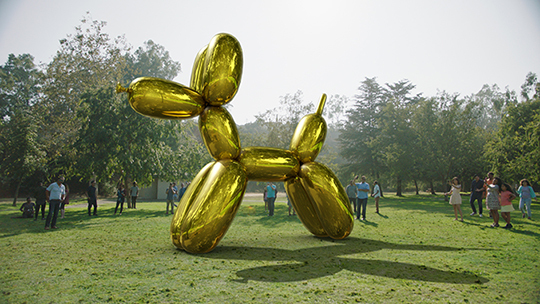 Koons built Lenses for Snapchat inspired by some of his most famous sculptures: Balloon Dog (Yellow), Balloon Swan, Rabbit, Popeye, and Play-Doh. These art exhibits landed in major parks and landmarks worldwide, including in the US, Canada, UK, Paris, Australia and Brazil. Live locations included Central Park, New York City; Millennium Park, Chicago; National Mall, Washington D.C.; Venice Boardwalk, Los Angeles; Roundhouse Park, Toronto; Hyde Park, London; Champ de Mars (Eiffel Tower), Paris; Copacabana Beach, Rio de Janeiro; Sydney Opera House, Sydney; and others.